Cedar Lodge in Torlundy, near Fort William, Highlands sleeps 4 people. 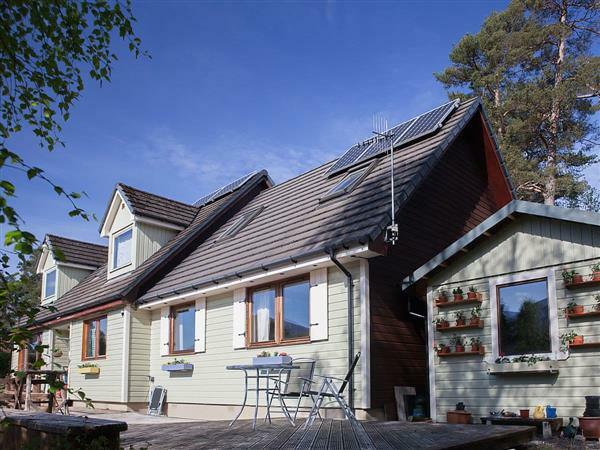 Cedar Lodge near Fort William has magnificent views of Ben Nevis and Aonoch Mor; this semi-detached property adjoins the owners’ home and offers the ideal location for exploring the Highlands. As part of the ‘outdoor capital of the UK’, there is a huge variety of outdoor activities for all ages nearby, including climbing, walking, skiing, snowboarding, mountain biking, sailing, kayaking, fishing, golf and much more. The world renowned downhill mountain biking tracks at Nevis Range are nearby, and a trip up the mountain in a gondola to admire the breathtaking scenery is highly recommended. Take a trip on the West Highland Steam Train (summer only), a must for any Harry Potter fans, or cross on the Corran Ferry and explore the Ardnamurchan Peninsula with its abundance of wildlife. Fort William has a variety of shops, restaurants and bars, and other things to do include the West Highland Museum, Ben Nevis Distillery and Treasures of the Earth. Close by there is a cycle path which you can ride or walk into the town centre. Cedar Lodge is also perfectly located for those wishing to visit Loch Ness, Skye, Glencoe and Oban. For those wishing to relax, the garden decking is a great place to relax and soak up the scenery. The shop is 2 miles from Cedar Lodge near Fort William, with the pub and restaurant 4 miles from Cedar Lodge. Kitchen: With electric oven, electric hob, microwave, fridge, dishwasher and washer/dryer. Bedroom 1: With king-size bed, single bed (for flexible sleeping arrangements), 22 Freeview TV and en-suite with shower over bath, and toilet. Living room: With 32 Freeview TV, DVD player and CD player. Oil central heating, electricity, bed linen, towels and Wi-Fi included. Travel cot and highchair available on request. Garden with decking and terraces (shared with owner). Hot tub for 4 (shared with owner). Private parking for 2 cars. No smoking. Please note: There are 10 steps and a pond in the garden. Holidays at Cedar Lodge run from Saturday to Saturday. For a better idea of where Cedar Lodge is, you can see Cedar Lodge on the map below. Do you want to holiday near Cedar Lodge (UK5804), you can see other cottages within 25 miles of Cedar Lodge; have a look to find your perfect holiday location.